Sunday's airstrike on targets in Syria was unusual for a number of reasons. First, it occurred in broad daylight, as opposed to hundreds of other strikes in which the Israeli Air Force has preferred to use the cover of darkness. Whatever was hit by Israel in Syria may have belonged to a category known as "time-critical targets," which means that they are visible one moment, and out-of-sight or out-of-strike access the next. That could mean that imminent plans were in place to move the target to a place where it would be harder to strike. Russia's Defense Ministry claimed that Israeli F-16s fired missiles at a target south of Damascus's international airport, and that Syrian air defenses intercepted seven Israeli missiles, using Russian-made Pantsir missiles. The Bashar Assad regime, for its part, released face-saving rhetoric, claiming that its air defenses "thwarted Israeli aggression." These claims are doubtful and seem to be aimed at avoiding embarrassment. It allowed Mount Hermon region to operate as normal, and no special instructions were issued to northern residents in general. This illustrates just how quickly events in northern Israel can escalate and how deceptive the daily routine is. The source of all of this tension is Iran's determination to build a war machine in Syria, and Israel's steadfast determination to stop it. 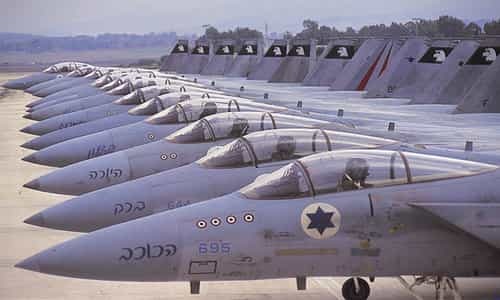 Israel seeks to minimize risks of escalation when it strikes Iranian targets in Syria, while also assuming that whatever these risks are, they will be smaller than the risk of allowing Iran to build a second war front on Israel's northern borders alongside the first one: Hezbollah in Lebanon. The Israeli airstrike also represents the first under the newly appointed IDF Chief of Staff, Lt. Gen. Aviv Kochavi. As the former head of the IDF's Northern Command and the ex-commander of the Military Intelligence Directorate, Kochavi has played a central role in Israel's large-scale preventative campaign against Iran in Syria in recent years. And he looks set to continue with it as chief of staff. Despite growing Russian pressure and the return of the Assad-run Syrian state following the end of the eight-year civil war, Israel's "war between wars" against Iranian entrenchment shows no sign of stopping. It remains unknown whether Russia is applying equally heavy pressure on Iran to scale back the very activities that attract Israel's firepower in the first place. While the Israeli and Russian governments appear to be in partial disconnect, the militaries of the two countries have received approval to hold a series of working meetings. Such meetings took place on Jan. 17, when a delegation of senior Russian military officials visited Israel, and met with the head of the IDF's Operations Directorate, Brig. Gen. Yaniv Asor. The IDF said that the meetings were held in a "good and professional atmosphere," and advanced the cause of preventing "friction between the two militaries in the northern arena, and [in the midst of] the IDF's activities against Iranian entrenchment and the arming of Hezbollah in Syria."